Carrie Clevenger did a riddle flash last week, and I’ve decided that this story makes for a nice little riddle, too. Can you guess what the creature is? “WHAT IS THAT? !” the archangel spluttered. The other archangel stood with his arms crossed, staring at the little abomination that had drawn such a reaction from his colleague. His own reaction had been much the same. The second archangel started to walk away, but then paused at the sight of the monster spitting a stream of water from the puddle in which it was playing. He turned back and crossed his own arms. The two could have been twins, arms crossed, heads cocked just slightly to one side. “He’s got fangs,” the first one said. The angels’ eyes met again, and they smiled. High above the ground, towering over the people who walk below, rests a leathery, eagle-eyed spectator. His claws grip the stones that serve as a monument to something beyond imagination. His teeth, sharp enough to pierce the toughest skin, are bared, waiting. Eyes that find him look away quickly, the shudders that follow a reminder of something savage. Thoughts swirl at the sight of him: why does something so grotesque exist on something so beautiful? But he is oblivious. The clouds gather above, and, as the skies darken, he feels a thrill of anticipation. Soon, it will rain. Did you guess? The answer is here, and you can read more information about his creation and purpose here. Thanks for reading! I had guessed a gargoyle, then went to find the answer and realized that it was THE gargoyle, heh. I’m sorry I haven’t a clue. You’ve got me stumped. I was stumped, but it was fun trying to guess! 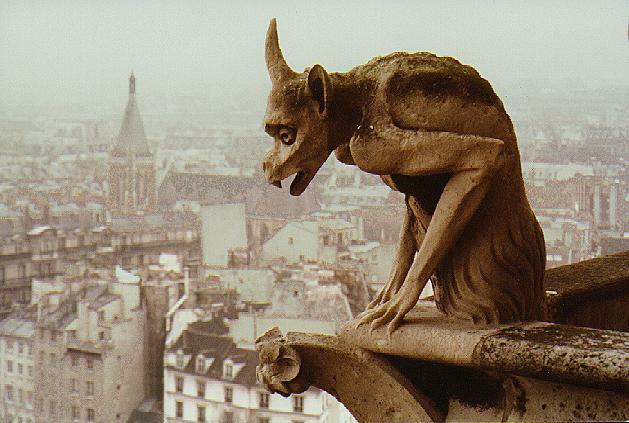 What is it about gargoyles? I just love them, too. Great job. Nice work. I did guess, but I kinda have a thing for Gargoyles, and have a few leering out of the trees in my garden. They’re not real. Well, not in the daytime. I love Gargoyles! Witty story! I like the idea of a gargoyle that never gets up or eats people. He’s just happy it’s going to rain on him. sometimes I just don’t get it – I’m off to read again!!! I was right! Silly angels, and is it just me or is there something ironic about God being upset about its creation when adorns so many churches? I was stumped as I didn’t know about the water thing! I thought it was one of those peeing cupids you see in fountains all the time… then thought gargoyles because of the fangs (and the one on the rooftop). Loved your story, Elizabeth! Gargoyle? I’m late to the party. Busy week. The dialogue was amazing. Elizabeth you are a great short story writer!